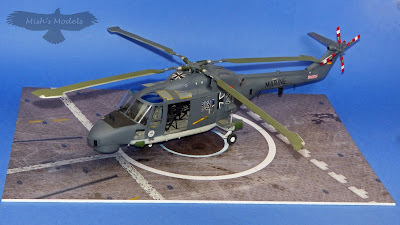 Gary from Coastal Kits was kind enough to send me the 1:32 sized version from his German Frigate Helipad Base for review. On arrival the base was as described. Constructed from durable, hard wearing 3mm Foamex board, which is a rigid, weatherproof plastic. The design is printed with the latest odourless latex ink onto laminated matt vinyl that gives a near photographic quality base. This all makes for a rigid but light display base. The obvious candidate to be displayed on this base was my 1:32 Revell Lynx Mk.88 in Marineflieger colours. As you will guess from the above scales there are bases for Armour, Vehicles and even some for maritime modellers. Founded in 2011, Coastal Kits is a family run business based in Blackpool, Lancashire UK and originally retailed plastic model kits and associated hobby supplies. During the latter end of 2012/early 2013 they introduced to market their own range of display bases, encouraged by a successful launch at Scale Model World Telford where they were well received. Because of the success and popularity of the product they decided to concentrate solely on the manufacture and supply of display bases. Continually developed, and after listening closely to their customers, the range covers a variety of popular scales and subjects with a choice of over 220. Custom bases are also provided to customer requirements when requested. If you're looking for an easy and inexpensive way to improve the display of your models Then a Coastal Kits Base is for you. Many thanks to Gary from Coastal Kits for sending this review sample.